Two Kiwi ladies went to India. One wrote about it, the other took lots of photos. They collected recipes from the people they met. 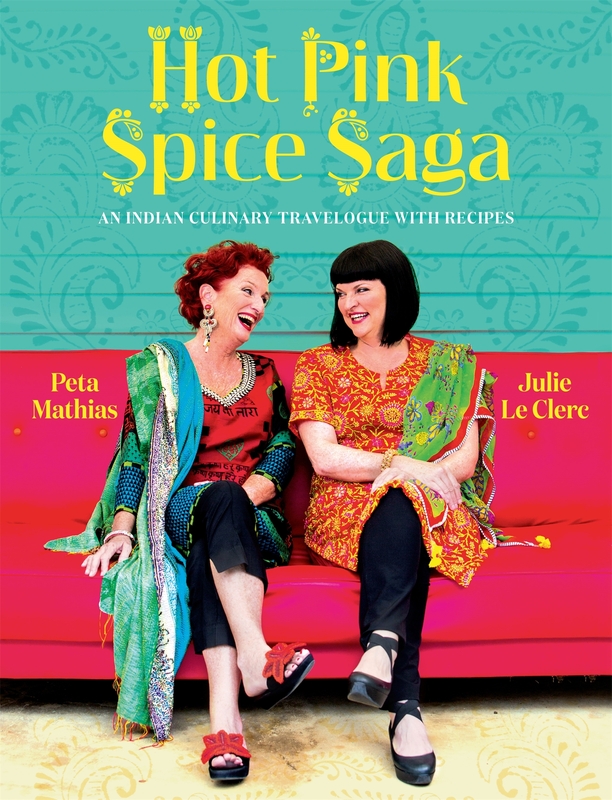 Finally they made it all into a book, and they called it “Hot Pink Spice Saga”. Which, I must admit, is a great title, and fits the book very well. It’s essentially a travelogue, describing the adventures of Peta, Julie and their gastronomads on a tour of India, and its most colourful culinary hot spots. I have something of a love-hate relationship with Peta’s writing. Her exuberance and the way she evokes a sense of place are amazing; but her habit of switching from present to past tense and her dodgy grammar are irritating. Julie’s photography is however consistently excellent, adding considerable visual flair to the book, and her epilogue was a welcome addition to the text. That said, I would have appreciated more detailed maps, perhaps accompanying each chapter. The recipes are an eclectic collection, even including some classic European dishes as they are still prepared in one of the grand hotels of Kolkata. What you get is real Indian recipes which have been adapted for New Zealand kitchens by New Zealanders. With suggestions for appropriate substitutes. Thus, if you can’t find jaggery for the vindaloo, (and it is a proper Goan vindaloo), it is suggested you use molasses. There are more recipes in the book than you might think, and you would have little difficulty putting together some very interesting and distinctively regional Indian menus. I was particularly taken by the rose-petal and mint ice-creams which would go very well after a curry. You’ll have to look elsewhere for basics like how to cook rice, although there is a nice brown rice pulao (which is much nicer than plain rice). There is also a very good how-to-make-paneer, and some courgette pakoras that I must try when the zucchini glut hits. Some people do lead interesting lives… and some of them do write about it. With varying results, but this is one of the good ones. It fits into a curious little sub-genre; the offspring of cookbook and autobiography. It is a personal story interspersed with recipes, and illustrations of pictures; most of them drawings by the author’s partner, but some lovely colour photos in a section in the middle. So, not the usual pictures of food that you find in a cookbook; and I must admit that it might have helped to have some drawings and diagrams with some of the recipes. 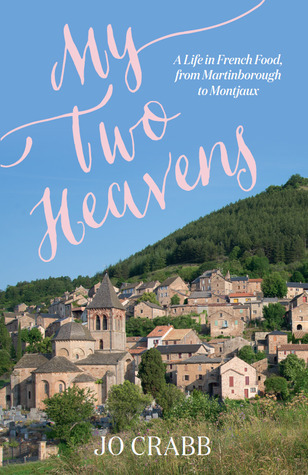 The writing is evocative… those few days in Paris last year kept coming back to me as the author described her second home in France. There’s something of the travelogue here too, from New Zealand to Britain, France, Morocco, the Middle East and India. The recipes come from all those cuisines; and are well-written with abundant anecdotes explaining exactly how to get it right (and what can go wrong). The author has an enthusiasm for the history of food which I can certainly relate to. I have only a few quibbles… if you’re going to write a personal history out of chronological order and wombling across the globe, it helps to put a place and date (even if it’s only a year) at the top of each section. The conclusion felt a bit weak… I guess that might be an autobiography thing, it’s not a genre I read in often. And the paper the book is printed on feels really rather pulpy – so sadly, it may not last as long as it deserves to. 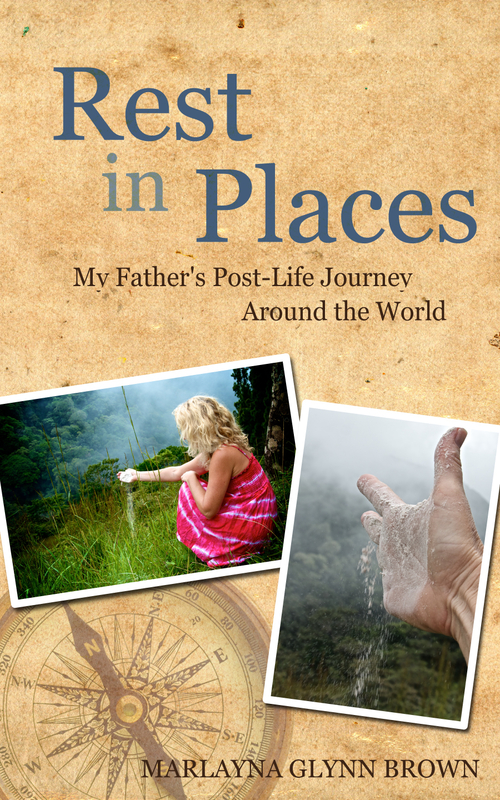 Join award-winning memoirist Marlayna Glynn Brown on a tender journey to understand the father she never knew in life by spreading his ashes around the world after his death. A relatable must-read for anyone who has lost a loved one, this memoir lights the way to afterlife and afterdeath where forgiveness supersedes pain, blame, remorse and regret. In her effort to understand the generational effects of alcoholism and subsequent dysfunctional adult relationships, Marlayna takes her youngest son and her father’s ashes on a personal journey, embarking on an emotional voyage to both physical and mental states of being. She confronts her own existence as a mother and a daughter, seeking and ultimately finding peace with her disappointment, anger, failed marriage, and complex relationships with her own four children. I sit at his bedside, my eyes focused on the thin plastic tube that brings oxygen to his nose. What a strange thought that my father can no longer breath without this tube. Years of smoking Kool menthols have eradicated any ability he has to breathe without aid now. So the thin plastic tube hooks over his ears, allowing him to pull weak breaths in and out of cancered lungs. My father, who once ran races and jogged around our city parks and swam off the Mexican shore in the Pacific ocean he loved so much, cannot breathe without the cool oxygen of this artificial tube. He tries to talk but his words are mired in wet coughs, rendering conversation cruel and laborious. There are so many questions I want to ask him, so much I want to know about his childhood, his life, his feelings, his essence. “Look at me,” he coughs. I don’t understand this kind of thinking; this acceptance of anything less than the highest and best. It’s the final and saddest nail in the coffin of my relationship with my father. During our last day together, I hear myself telling him that I want him to be at peace. I want him to be out of pain. I know even as the words are tumbling from my consciousness and out of my mouth that my father’s death is not about me; his passing is not dependent in any way upon what I want. It is his journey and I am no longer on it. Then again, I never really was in the first place. For how could you ever be on a journey that is not your own? Marlayna Glynn Brown is a best selling American memoirist, award winning photographer, screenwriter and yogi. Immediately upon publication Marlayna’s first book became and still remains one of the most highly rated author memoirs on Amazon, and placed as a finalist in the 2013 Next Generation Indie Book Awards. Find Marlayna on Facebook, Twitter, and visit her at www.marlaynaglynnbrown.com.